Who Does This Guitar Appeal To? Conclusion – Is The Peavey Raptor Plus The Right Guitar For You? Every great musician uses a great instrument, and choosing a high-quality guitar when you want to play, practice, or perform is important. No matter what type of music you want to play or how long you have been playing, selecting the right guitar for yourself will make a huge difference in the quality of your tone as well as how happy you are when playing. Taking time to fully research the instrument you are considering will help you choose the right one for you. Peavey has long been known for producing not only exceptional accessories and equipment for musicians, but also amazing guitars, and the Peavey Raptor Plus isn’t any different. Most musicians already know that when they buy Peavey equipment that they are making an investment in their future as a musician, as Peavey produces equipment and instruments that are not only intuitive and easy to use, but also reliable and will last for a very long time. The Peavey Raptor Plus is a great example of Peavey’s commitment to quality and their focus on creating some of the best instruments on the market. Before you can assume that this guitar is the best choice for you, you need to make sure that you take into consideration all of the features and specs of the guitar. This makes it easy not only to see what the guitar really has to offer, but to think about whether or not it will meet your needs. Once you have all of the information about the Peavey Raptor Plus, you will be better able to make a smart decision. Even though this is a great product, it may not be for everyone, which is why careful consideration is so important. Beginning musicians often have to settle for lower quality guitars that are playable but simply don’t offer the sound and tone that more expensive options do. This is unfortunate because even beginning musicians deserve to have a great instrument that is fun and easy to play. The Peavey Raptor Plus was designed to be accessible to a wide range of musicians, thanks to its competitive pricing as well as how easy it is to play this instrument. Not only is it perfect for recording and playing at home, but when connected to the right amplifier, this guitar offers incredible power as well as a wide range of tones and notes. The solid construction of the body adds some weight and heft to the instrument, which makes it perfect for musicians who aren’t suited to controlling something that feels a little lighter. More advanced musicians who understand how to really play the guitar and aren’t looking for a starter instrument may want to choose something other than the Peavey Raptor Plus. While this is a wonderful first guitar, it simply doesn’t have the rich tone that you can get with another, more expensive, option. When you buy the Peavey Raptor Plus you shouldn’t expect a lot of extras, which means that you need to be prepared with the equipment and accessories that you will need already or be willing to buy them. This guitar ships with stock strings, and while there’s nothing wrong with them, updating them with nicer strings will instantly improve the way the guitar sounds. Additional items that a musician will need include an amp, picks, capo, strap, and tuner, if necessary. Thanks to the wide top pole single coil pickups, the Peavey Raptor Plus has a much larger string window than other similar guitars, which is great for a deeper and more resounding tone when you play this instrument. It was designed not only to be accessible to new guitarists who want to learn how to play guitar, but also for musicians who know how to play but are interested in learning more about controlling and adjusting sound quality and tone. The due action truss rod included in the Peavey Raptor Plus makes the guitar much more stable when exposed to climate changes. While the neck can be twisted, it is very easy to reshape it. While some musicians are concerned about a dual action truss rod adding too much weight to the instrument and affecting the tone, the Peavey Raptor Plus is perfectly balanced with a clear and bright tone. One alternative to the Peavey Raptor Plus that is worth considering is the Yamaha Pacifica Series PAC112V. 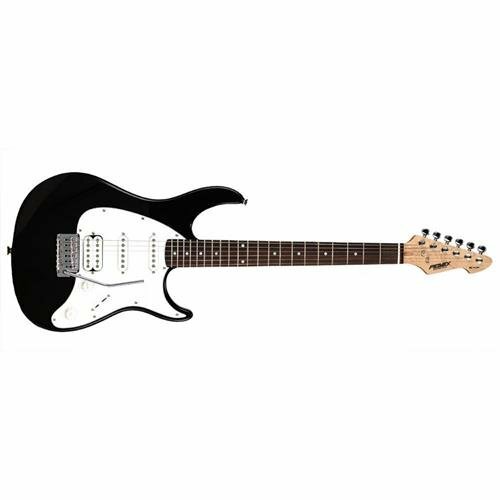 This guitar is in a higher price range, but the sound quality is improved, while the instrument is just as easy to play. Thanks to the solid alder body, rosewood fingerboard, and vintage tremolo, this Yamaha offers a deeper and more robust sound. Musicians who are interested in keeping their options open and have a higher budget for a new guitar will want to consider this one, as it may be the better choice. Beginning guitarists can rely on the Peavey Raptor Plus to be a great instrument for learning how to play the guitar. Musicians who haven’t ever picked up an electric guitar before will be surprised at the fast and smooth fret action of this guitar and how easy it is to tune it up and start playing. Because it is such a cost-effective instrument, it’s a great choice for people who aren’t sure that guitar is right for them or for a church that needs to buy new instruments for their band. There are many guitars on the market that offer more power and control, but they are in a completely different price range. For that reason, musicians need to decide if they are willing to compromise a little on the power and clean sound that a higher quality instrument will offer them and instead choose the Peavey Raptor Plus. This is a reliable guitar, one that will help new guitarists get the feel for playing guitar, but it won’t easily grow with an artist. For this reason, musicians who are advanced or willing to put in long hours of practice may consider buying a more advanced instrument now or in the future.